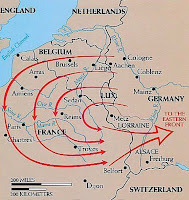 The Historical Society: Was There a Schlieffen Plan? In a 1999 journal article published in War in History, historian Terence Zuber dropped a bombshell on the academic community. He argued that the Schlieffen Plan, or the German attack plan during World War I, was a post-war construction written by the generals to justify why the Germans lost the war. He based his argument strictly on not only the primary sources that have been around since the War, but also new sources that became available with the fall of the Berlin Wall. Zuber’s individual pieces of evidence are circumstantial. Take all of it into consideration, however, and he makes a compelling case. 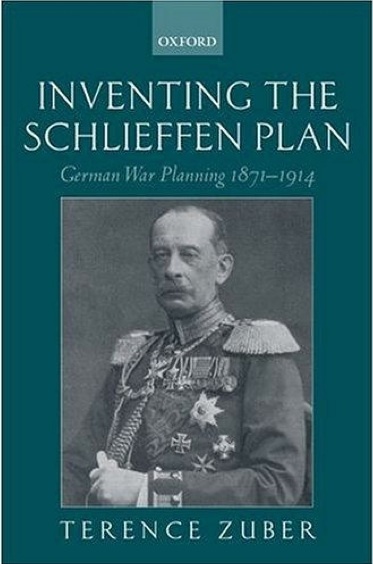 A few years later, he published a book on the topic with Oxford University Press (Inventing the Schlieffen Plan: German War Planning, 1871-1914). Zuber challenged that history. He wrote that there never was mention of a “Schlieffen Plan” before 1920. Instead, he argued that when one historian wrote that Germany employed the wrong strategy, the generals and other members of the General staff, Kuhl, Ludendorff, Foerster and Groener, countered with the myth that Schlieffen had conveyed his master plan to Moltke, but that Moltke failed to understand it. One should note that historians base their histories of the war on Ludendorff and others’ accounts. According to Zuber, Schlieffen did have some contingency plans, although they remained in his possession until he died, and were not locked in the vault with the rest of the German war plans. Zuber insisted that on its own, the Plan, or Denkschrift was a nightmare, poorly organized, and called for troop numbers that never existed. Schlieffen’s war games, as evident in his writings and handwritten diagrams, did not resemble the master plan, or anything close to it. Zuber based this argument on the newly discovered German staff memorandum, prepared by Major Wilhelm Dieckmann. Dieckmann was a German officer whose task was to write a history of the war, and he therefore had access to many of Schlieffen’s notes, and war plans before Allied bombings during World War II destroyed them. According to Zuber, Dieckmann’s manuscript revealed that Schlieffen’s “Plan” intended to keep the East strong and hold off the French by defeating their fortification line. Schlieffen never envisioned swinging wide around the Paris and defeating the French army. If this is true, then the Schlieffen Plan, as we know it, is wrong. T. Holmes, 'A Reluctant March on Paris', in: War in History, 2001; 2: pp. 208-32. T. Holmes, 'The Real Thing' in: War in History, 2002, 1, pp. 111-20. R. Foley, 'The Origins of the Schlieffen Plan' in: War in History, 2003; 2 pp. 222-32. T. Zuber, 'The Schlieffen Plan was an Orphan' in: War in History, 2004; 2 pp. 220-25. R. Foley, ‘The Real Schlieffen Plan’ in: War in History, 2006; 1, pp. 91-115. Plan’ in: Journal of Strategic Studies XXVIII, 2005. Mombauer’ in War in History, 2008; 1. pp. 92-101. Planning’ in: War in History, 2008; 4, pp. 389-431. War in History, 2009, 16 (1) 98-115. Steve: Thanks for this post. Very interesting. Knowing next to nothing about military history, this was news to me. It reminds me of other ways historians have argued against the reality of eras and events that have been taken as iron-clad fact: the Great Awakening, the Dark Ages, 17th century Wars of "Religion" etc. Well at least one of Zuber's claims (that there was no mention of a Schlieffen plan prior to 1920) has been proved incorrect by his critics who have unearthed numerous references to it in 1914 by senior officers like Prince Rupprecht, Falkenhayn and Groener. As far as I can see the only credible historian who treats it seriously is Strachan but then his books are littered with assertions that clearly assume the existence of a German grand strategy in 1914 that focused on France first; and consequent operational schemes involving a defensive stance in the East and a high speed, massive, wheeling invasion of Belgium and Northern France whose goal was the envelopment of the French armies east of Paris. This looks very like the Schlieffen duck to me. Who are these critics? and feel free to actually post some examples of these "numerous references". If the Schlieffen Plan was such common knowledge, why would it take until the 2010s for these pre-1920s references to be "unearthed"? 1)Schliefflen calculated that a deep thrust into France via Belgium was short 24 combat divisions. He also points out that Germany did not possess before the war universal conscription. Only 55% of the German males 18-35 actually served. Therefore, any future plans that called for a deep enveloping action would have to somewhere make up for this large shortfall. These divisions would account for an additional 5 Army Corps (or more) that the Germans never possessed. 2)German intelligence up to 1914 calculated that the Russians would be able to deploy at least 5 field armies in not six but 3 weeks after mobilization was called. One of the most important assumptions about the Schliefflen Plan was the supposed inadequate mobilization infrastructure of the Russians. Yet, in the annual intelligence estimates (that Zuber uses), the German General Staff knew since 1910 the Russians made great strides. Furthermore, they accurately estimated an additional 1 million Russians would be called to the colors by Winter 1914-1915. 3)When the Schliefflen Plan was supposedly hatched and given operational flesh, the French deployment scheme was defensive. It was anchored between the fortifications at Belfort in the south and Verdun-Toul in the north. According to the proponents of the Schliefflen Plan, the French was offensively predisposed in 1905. This was not the case. The French railways were configured in such a way as to allow them to shift their forces from the south to the north in short order. It was not until after 1910 that the French changed their strategy 180 degrees. 4)The fortifications around Paris were some of the strongest in the world. 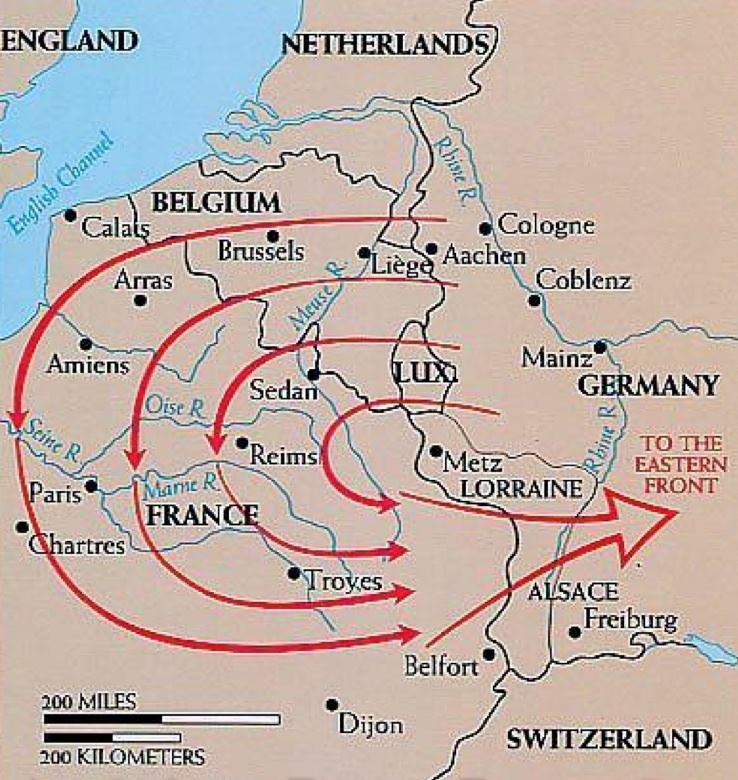 In intelligence estimates from 1894-1914, the German High Command frequently stressed that the chances were high that if the French were forced to retreat that they could easily withdraw to the Loire and make Paris a fortified zone; thus, negating whatever advantages Germany enjoyed at the outset. Again, there was no mention about some "Super Cannae" maneuver that enveloped Paris from the west. 5)Using Germany's own resource estimates (men, ammunition, railways, supply chains), it is highly unlikely that they had some "perfect" plan to defeat the French in D-Day+ 39. 6)Finally, it was over a decade until those involved with the German war-planning began to publish their own take on things. None of the source documents, etc... were ever made open to scholars.